From the industrial West to Latin America and Asia, people generally point to financial concerns as their most pressing personal problem. When respondents were asked to describe in their own words the biggest problem confronting them and their families, economic difficulties were cited most frequently in 40 of 44 nations surveyed. Nearly half of Americans and British who were surveyed (46% each) mention economic difficulties most often, as do four-in-ten Canadians and French (40%, 37%). And in some middle-income countries that have suffered economic downturns recently – notably, Argentina, Turkey and Russia – as many cite economic problems as in many of the most impoverished nations such as Senegal, Mali and Bangladesh. Joblessness is a major concern in Latin America. Fully 40% of Peruvians and roughly three-in-ten Bolivians, Brazilians and Argentines mentioned unemployment as the leading problem facing them and their families. Inflation and high prices are generally viewed as less of a problem, though 58% of Indonesians point to this as their main concern. Again, this is not surprising given that prices were rising dramatically in Indonesia in 2002. In many poor countries, there is a range of competing problems aside from a lack of money or work. Fully six-in-ten Angolans cite health concerns as most important, (28% specifically referring to the lack of clean water). More than in any other countries, people in Angola, Pakistan, Russia and Uzbekistan cite housing as a major problem. And in Bangladesh, 47% of the public cites personal family problems and other troubled social relations as most important to them. In Germany and Italy, slightly more people named health problems than the economy as their top personal concern. And health is the second leading concern in most other nations, regardless of economic status. Despite wide variations in income, roughly the same proportion of respondents in South Korea, India, Russia and Ghana cite health concerns as among the most important in their lives. Throughout much of Asia, educational concerns rank relatively high in people’s minds. While many refer specifically to the availability of quality education for their children, even more prevalent are worries about educational expenses. In most countries where educational concerns rank high, it is the cost of providing education for children that is mentioned most by those surveyed. Crime is a particularly salient issue in Latin America. This is seen not only in the high level of personal concern over this issue, but also in the in the overwhelming perception among people in this region that crime is a major national problem. One third of Hondurans (32%) cite crime as the most important problem they and their families face, and this concern is also widespread in Mexico and Guatemala. Outside of Latin America, only South Africans raise crime as a major personal concern, reflecting that country’s high crime rate. Japanese tend to take a dim view of their lives and their futures, as might be expected in a country where the economy has been stagnant for a decade. But as in similar surveys in the past, Japanese respondents were hesitant to voice any major personal concerns. Fully 43% of Japanese respondents – a far greater proportion than any other country – acknowledge no major personal problems. Among those who did give a response, economic and health problems stood out. Most people in the West have a positive view of their personal lives. Two-thirds of Canadians and nearly as many Americans give their current lives the highest rating – at least seven on a scale from zero to ten. Smaller majorities in Western Europe also express a great deal of satisfaction with their lives today. But aside from a few other pockets of contentment, people outside the West express far lower levels of satisfaction. Fewer than four-in-ten people in every African country surveyed rate their lives highly, possibly reflecting the fact that African nations account for nine of the eleven poorest countries in the Global Attitudes survey. Generally, personal satisfaction in a country is strongly linked to per capita income adjusted for price differences between economies. While respondents in much of Eastern Europe express low satisfaction with their personal lives, those in the Czech Republic – which has the highest per capita income in the region – are a notable exception. Four-in-ten Czechs give their lives the highest rating, more than any other nation in the region. By contrast, nearly half of Bulgarians and over a quarter of Russians and Ukrainians give their lives very low ratings (three or less on a scale of zero to ten). Still, income alone does not always predict how people evaluate their lives. Personal satisfaction in Mexico and South Korea is at roughly the same level as in Western Europe, which has a much higher per capita income than those two countries. And respondents in Turkey express less satisfaction with their lives than people in other nations in the Middle East/Conflict Area. Turkey has the highest adjusted per capita income among those countries, although its economy has been mired in a recession. For the most part, Eastern Europeans are unhappy with their lives today, particularly when compared with people in Western Europe. Only about a fifth (19%) of the respondents in Russia rate their lives highly, and this is similar across most other former Soviet-bloc nations. Yet there are signs that Eastern Europeans believe their lives have improved since communism collapsed in the early 1990s. In The Pulse of Europe, a multinational survey conducted in 1991, fewer than one-in-ten Russians (7%), Ukrainians (7%) and Bulgarians (3%) rated their lives highly. In addition, young people in these countries are far more optimistic today than their elders. While in Western Europe there is a modest age gap over how people view their lives, that gap is much wider in Eastern Europe. In the Slovak Republic, twice as many people younger than age 35 give their lives the highest rating, compared with those 60 and older. Even in Russia, Ukraine and Bulgaria, which have the lowest personal satisfaction levels in the region, young people are much happier with their lives than their elders. Not only do people in North America and Western Europe express satisfaction with their current lives, they generally believe their lives have improved over the last five years. This also is the case in Asia, with the prominent exception of Japan, where the economy has been stagnant and unemployment is at record levels. But there is a mixed record of progress elsewhere in the world. Most Argentines believe their lives were better in the late 1990s, before that nation’s devastating economic and political crisis. Seven-in-ten (69%) give their lives of five years ago a high rating. But six-in-ten say they have lost ground since then, while just 19% think their lives have gotten better. In Venezuela, pessimism is nearly as prevalent; 57% say life has gotten worse over the past five years compared with 23% who think things have improved. While Eastern Europeans feel their lives are better off since the collapse of communism, many say they have lost ground over the past five years. A majority of Bulgarians (55%) believe their lives are worse today, as do pluralities in Ukraine, the Slovak Republic and Poland. Again, Czechs are the exception – 41% think they have made progress while 27% believe they have lost ground. Russians are divided on this point (37% say they have lost ground, 36% feel they have made progress). On balance, people in Turkey, Pakistan and Lebanon all believe their lives have gotten worse over the past five years. By two-to-one (49%-24%), respondents in Turkey say they have lost ground compared with five years ago. Comparable pluralities in Pakistan and Lebanon agree. By comparison, Jordanians and Egyptians have a net positive opinion of the progress made over the past five years. While Asians give their current lives a modest rating, in most countries there is a sense that things have improved. In China, for example, 42% of respondents rate their current lives more highly than their lives of five years ago, while 27% disagree. In Bangladesh and Vietnam, majorities say have made progress over the past five years. But in Japan, nearly twice as many feel their lives have gotten worse in that period as believe things have improved (39% vs. 21%). Even in countries where people are gloomy about the present and recent past, there is broad optimism about the future. Asked to assess the state of their lives five years from now, more people in every country express optimism than pessimism. That is the overwhelming sentiment in seven of the eight Asian nations surveyed. In Bangladesh and Vietnam, only about one-in-twenty expect life to get worse over the next five years, while solid majorities believe their lives will improve. Optimism is also the dominant view in South Korea, China and Philippines. Japanese, by contrast, are more conflicted. Roughly a third (34%) expect their lives to improve, while 27% say their lives will be worse. People in Latin America also are bullish about the future. In Venezuela, where a majority thinks that life has gotten worse in the past five years, there is widespread optimism. Six-in-ten (62%) believe their lives will be better off five years from now. That view is not as widely shared in economically beleaguered Argentina. Still, optimists outnumber pessimists by 14 points (36%-22%). In North America and Western Europe, respondents also express a high degree of confidence about their personal futures, though there is a bit less optimism in Germany than elsewhere. Fully 61% of Americans rate their personal future more highly than the present, while just 7% expect their lives to get worse. That is the dominant view in Canada and Great Britain as well, though less so in France and Italy. In Germany, 35% rate their future life better, 19% see it as worse. 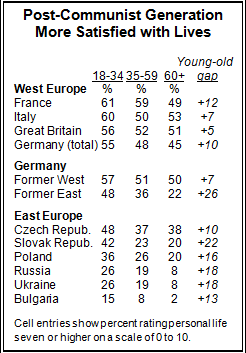 Respondents in former East Germany are less optimistic about the future than are those in the West. Interestingly, although the Czech Republic stands out among Eastern European countries for levels of personal satisfaction, a relatively high proportion of Czechs (25%) believe life will get worse over the next five years. Respondents in Bulgaria have a strikingly negative view of the present, but there is as much optimism about the future in Bulgaria as there is in the Czech Republic. In most countries, there are profound differences between how people view their own lives and futures and how they view those of their children. Significantly, while respondents in the U.S., Canada and Western Europe express far more personal satisfaction and optimism than people living in other countries, their perceptions of continuing progress do not extend over a longer time frame when asked what the future holds for their nation’s children. Half of Americans think children will be worse off when they grow up, compared with 41% who think their lives will be better. The British hold a similar view, while Italians, French and Canadians are even more pessimistic about what lies ahead for their country’s children. By nearly three-to-one, Italians think children will be worse off when they grow up compared with how people live today. Yet most Asian respondents – outside of Japan – have an upbeat sense of children’s futures. Eight-in-ten Chinese say the country’s children will be better off than people today; just 9% say children’s lives will be worse. South Koreans, Indians and Indonesians are bit less optimistic, but they still have greater confidence about children’s futures than do Americans or Europeans. But the Japanese are even more pessimistic about their children’s lives than they are about the present or the future. By nearly four-to-one (67%-18%), Japanese believe that when the current generation of children comes of age, their lives will be worse than people today. The gap in optimism between Eastern and Western Europe when people were asked about their own futures is largely reversed when they look to the future of their nation’s children. Solid majorities of Czechs, Slovaks and Ukrainians say children will be better off than people today. Even in Bulgaria and Russia, more respondents see children’s futures as positive than negative. Poland is the only country in the former Soviet bloc where people are more likely to see children faring worse than people today. Respondents in every country voice more satisfaction with their family lives than with their incomes or jobs. But there are some countries – including several with substantial Muslim populations and two in Eastern Europe – where significant minorities have a negative view of their family lives. Fully 44% of Jordanians and 36% of Pakistanis say they are very or somewhat dissatisfied with their family situation. Nearly three-in-ten Bangladeshis and Indonesians also voice dissatisfaction with their family lives (28%, 27%). In Russia and Ukraine there also is notable dissatisfaction with family life; roughly three-in-ten of those surveyed express that opinion. Turning to the financial side of life, roughly seven-in-ten respondents in North America and Western Europe say they are very or somewhat satisfied with their household income. In Asia, people also have a generally positive view of their earnings. Even in Japan, where fewer than one-in-ten rate give the economy a positive rating, 58% say they are at least somewhat satisfied with their household income. But in much of Eastern Europe, the overwhelmingly negative opinion people have of national economic conditions parallels how they view their personal financial situations. Only about one-in-five respondents in Russia, Ukraine and Bulgaria are satisfied with their household income. Only in the Czech Republic and to a lesser degree the Slovak Republic do many people take a positive view of their earnings. In all but a few countries, majorities of working people express satisfaction with their jobs. Job satisfaction is particularly high in North America and Western Europe, while it is especially low among working people in Jordan (20%) and a number of African nations. Except in the industrialized countries, significant numbers of respondents in virtually every other nation report that in the past year there have been times when they have been unable to afford food, clothing or medical care. It is important to note that this question is not a direct measure of deprivation; rather it asks respondents whether they have been able to afford these basic items. As might be expected, people in countries with low per capita incomes, especially in Africa and Latin America, are most likely to say they have been unable to afford food, clothing and health care. Majorities in seven of ten African countries surveyed say they have gone without food at some point over the past year for lack of money. Yet clearly, this experience is commonplace in higher income nations as well. Roughly half of Russians say there have been times when they have been unable to pay for food (50%) and health care (54%) in the past year, and 68% have forgone buying clothing. The number reporting such deprivations is comparable in Ukraine and Bulgaria. The global survey shows that going without some basic necessities is far more common in the United States than in other major countries. A quarter of Americans say they have at least occasionally been unable to afford health care in the past year, while 19% have gone without clothing and 15% food. Overall, a third of Americans say they have encountered at least one of these hardships in the past year. Such findings are in line with Gallup and Pew Research Center surveys dating back to the 1970s. By comparison, levels of deprivation are significantly lower in Western Europe, Japan, and such countries as the Czech Republic and South Korea. In Japan, just 9% say they have been unable to afford food, clothing or health care in the past year, the lowest level of the 44 countries surveyed.